This resource features the general description of Garia, a small town raided by hill giants. It includes adventure ideas that are appropriate for mid-level (Levels 6 to 10) adventuring parties. Challenge Rating (CR) is calculated using a party of four as the model. Garia is a small fishing town on the western coast of the kingdom. The Great Lake is fertile with fish and shrimp so the population of Garia slowly gained traction in the past few years. In exchange for a tithe deal with the kingdom, the royal family sponsored the building of a wall to protect Garia from whatever threat they thought put the small town in danger. For years the wall gave a feeling of safety to Garians but it was seldom used. Not that it would amount to much protection, the wall was only ten-feet high. Miles away to the east, the hulking body of a giant stood before a regional map of the kingdom. The giant stared at the lines on paper and the squiggly symbols all over the thing. What did the minuscule goblin call them? Letters? But they held absolutely no meaning to him, except a waste of time. But the small goblin insisted on it. He had been right about so many things before. He was small, weak and annoying. But after so many rights, it was hard to doubt him. The last raids had all been directed by Raftkin, the goblin. “You take giants there?” Asked Chief Oogt. Raftkin only smiled and nodded. It has all started when the giants captured Raftkin and intended to cook him for dinner. Raftkin is fast with the tongue and managed to convince the giants of his worth. After a night of talking, Raftkin convinced Chief Oogt to travel south to the King’s Road and raid a caravan of merchants. It all panned out alright for the giants so Chief Oogt decided Raftkin was useful. Since then it is not clear who is using who. Chief Oogt believes he uses Raftkin’s inexplicable talent to choose the best places to raid. On the other hand, Raftkin thinks he took control of the hill giant tribe by manipulating the boss. 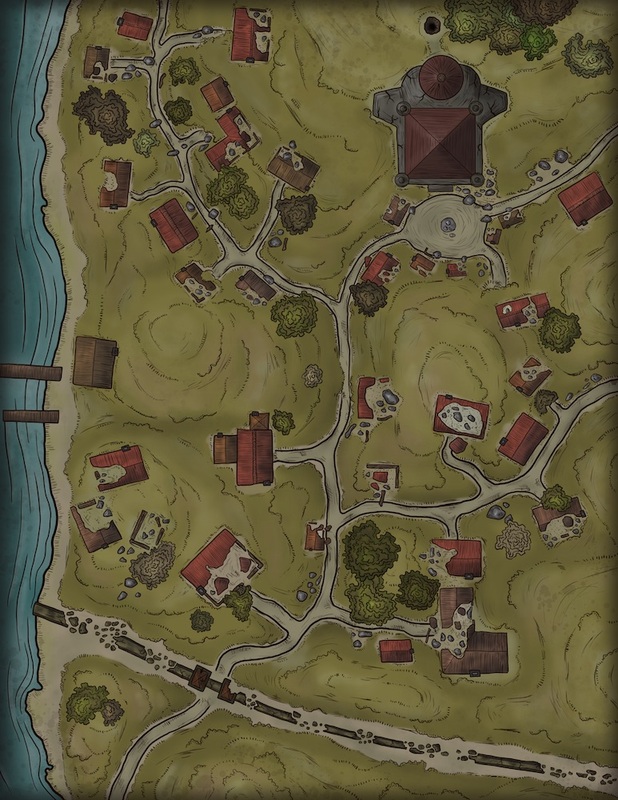 Raftkin rolled up the kingdom map and assured Chief Oogt the small town did not have many defenses. Yes, they had a wall, but very few guards. The giants would take the city in a manner of minutes. Not that Chief Oogt understood the abstract concept of time. But he trusted Raftkin. He came to the conclusion that Raftkin was a kind of gifted seer, an oracle of fortune for the tribe. Raftkin’s decisions had no esoteric background, he was just more intelligent than the simpleminded giants. And he knew how to read. Before the next moon came, Raftkin and the giants stormed the town walls after dawn. Like Raftkin predicted, the guards were few and they were nowhere near ready to defend against such an onslaught of power and flying rocks. As soon as the second rock destroyed a section of the wall, the guards disbanded and ran for their lives. The giants destroyed the wall and entered unimpeded. They threw boulders at buildings, killed townsfolk with their enormous weapons and stole whatever cattle they found. Two of them went for the fisheries and sacked them. No one stood in the giant’s way until they reach the main square in front of the temple. Sir Donnaf Farediu, the only anointed knight in town decided to make a stand against the giants. Chief Oogt fought the fearless armored human in the square. Chief Oogt was ten times as strong as Sir Donnaf, but the foolish man was faster. Sir Donnaf managed to fatally wound Chief Oogt, but it did cost him his life. Sir Donnaf died in the square defending the remaining townsfolk hiding in the temple which so far had withstood the giant’s boulders. Chief Oogt sat near the crumbled statue in the middle of the square. The rest of his tribe saw him and knew he was done for. With Chief Oogt impending death, the tribe split into two factions supporting the next bigger two giants. Golk and Tabbata gnarled at each other from opposite sides of the squares, trying to demonstrate their worth to the rest of the tribe. Tabbata was the smartest. As soon as Chief Oogt lost the fight he caught Raftkin and put him in a sack. He knew he was valuable but didn’t know how or why. After this both factions of the giant tribe parted and dispersed, forgetting the townsfolk in the temple and abandoning dying Oogt. The background lore above sets the pace and opportunities for an interesting adventure. It is intended that the adventurers reach the location after it was attacked by the hill giants. They will see the destruction of the town as they walk to the main square. Corpses of dead peasants along the road. In the main square, the dead body of Sir Donnaf Farediu; facing upwards and grasping his sword to his chest. Leaning against the pedestal in the middle of the square is Chief Oogt, still alive but barely. A fatal sword wound in his back. The peasants holed up in the church have not dared come out. They believe the giants are still around and waiting for them to open the doors. This sets an interesting situation. Chief Oogt is guilty of the town’s fate but he will try to negotiate with the party if they let him. He blames a goblin oracle named Raftkin for his demise. He offers a deal. If they heal him, he will help them find the giants, reunite the tribe and migrate north, never to return. If he is refused, he claims another giant will become chief and return in force to finish sacking the town. He only asks that if they go reunite the giants, Raftkin belongs to him. This quest is scalable for different party levels. The DM should adjust the exact number of giants for the tribe. Or the number of giants present for any particular encounter. If the party helped Chief Oogt, then expect that not all giants wish to return to him, ensuring a smaller fight. If at some point the adventurers capture Raftkin, he will thank them and explain that while goblins do have a terrible reputation, he is just in the wrong place at the wrong time. This is, of course, all a lie, but he will claim the giants captured him and, deceived by their own short-sided interpretation of the world, designated him the source and oracle for their fate. If all else fails, Raftkin can attempt to exchange his freedom for the location of an ancient temple where a great treasure lies unfound. The DM is free to decide whether this is another ruse or a real place.